Manchester UTD and Liverpool collide in a blockbuster match in Premier League this Saturday. Are you placing a bet on this game? Don't miss the latest Ladbrokes enhanced offer! You can get 25/1 ANY goal to be scored in Manchester UTD vs Liverpool + £5 free bet should the match end 0-0! Manchester UTD and Liverpool played out a goalless draw at Anfield Road earlier this season and it's very unlikely that these two teams will fail to find the back of the net again! The "Any team to score" bet is normally available at 1/25, so this offer is a huge bargain! 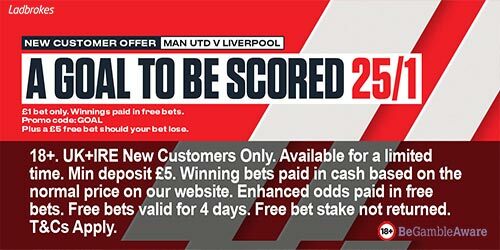 Claim this price boost in less than two minutes, follow our instructions..
Join Ladbrokes via our special links and claim 25/1 for ANY goal to be scored in Manchester UTD v Liverpool! 3) Place a single bet of up to €/£1 on ANY goal to be scored in Manchester UTD v Liverpool before the kick-off. Ladbrokes offer 25/1 A goal scored in Manchester UTD v Liverpool + £5 if you lose! "Get 25/1 ANY GOAL in Man UTD v Liverpool at Ladbrokes + £5 free bet"